Initial and most important to a lasting colour application. Creates an even and smooth surface. Eliminates streaking and pigment staining from other colours. Adheres to natural nail plate to securely bond nail colour. Stretchability of priming minimizes cracking and chipping. Directions > Apply thin coat to bare nail sealing free edge with complete coverage. Priming is the initial and most important step to long lasting success of nail colour application. It creates an even and smooth surface & eliminates streaking and pigment staining from other colours. 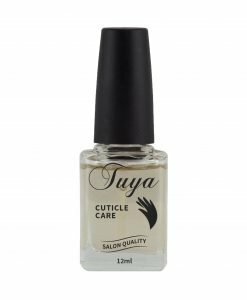 Tuya base primer has been formulated to adhere to the natural nail plate for perfection and acts as a secure bond for the nail colour. The stretch ability of priming minimizes cracking and chipping. Apply to clean dry nails, sealing the free edge. BASE PRIMER IS TOTALLY DIFFERENT TO CLEAR OR TOP COAT. No Toluene, Formaldehyde, Formaldehyde Resin, Camphor, TPHP, Xylene or DBP. Nitrocellulose, Etocrylene, SD Alcohol 40B, C142090.